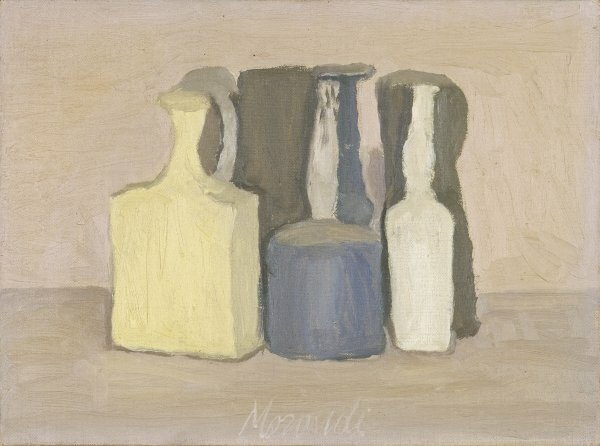 The result of one of the happiest moments in Morandi's art (in 1948 he won the Grand Prix for Painting at the Venice Biennial), this Still Life is a work amply representative of his most mature style. The composition of seven objects, with the square yellow "Persian bottle" in the foreground, was approached by the artist with particular interest-so much so that the Catalgue raisonné contains five variants of it, three dated to 1948 and two to 1949.1 None of the canvases is dated, however, making it difficult to establish the year of execution with any real certainty. In the present writer's view, it would be more correct to consider them all a single, homogeneous group with a common date. Of the five paintings, this one, which was formerly in the important collection of José Luis and Beatriz Plaza, and the rather more closed, compact one in the Kunstmuseum in Winterthur are the best-known and most celebrated versions. The clearly Morandian quality of the painting is evident firstly in the linearity of the composition, in which every shape, although moved and articulated in its individuality, helps to determine the overall form of the whole, a rectangular mass defined in accordance with clear spatial co-ordinates. Another important point is the choice of "models", which are among the artist's favourites. In the present work, it is possible to recognise in the background the large dark red carafe with the handle painted white and the tall glass jar with the long blue neck. In the foreground, apart from the Persian bottle, which dominates the scene as always, we also see the turquoise-blue bottle with chalk-white neck and the even more limpid round bottle placed on the right as a third element on the stage. Finally, there is the range of colours, all contained within a scheme of honey-beige and deep tones of grey-the two predominant colours in all of Morandi's chromatic explorations-with the three bright patches in the foreground. The composition anticipates an arrangement that is found again fairly frequently in 1954-1955 and which seems almost to represent an initial study in Morandi's profound investigation of the creation of a composed, concentrated form, achieved solely through the singularity and movement of the individual elements of which it consists. The models in the background crowd together and touch until they almost merge into one another (apart from the empty space that opens up between the two tall dark jars on the right, creating a new form that is totally illusory but at the same time clearly defined and present on a visual level). Thus the background offers itself to the eye as a silent "back-stage" area, with the three main objects standing out against it. These can also be interpreted as shapes that have been detached and immersed in a milky but warm, enveloping light which nourishes them and makes them emerge from their indistinctness.